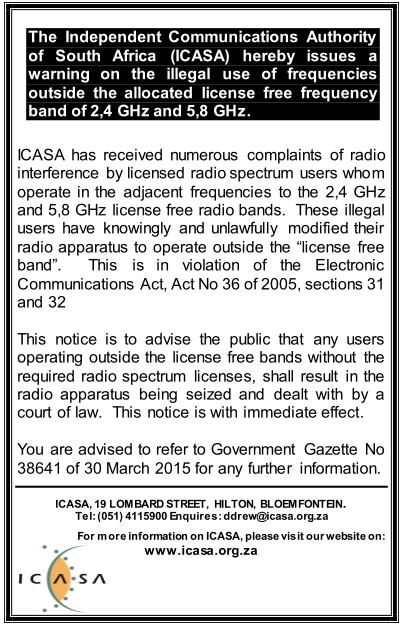 [18 August 2016] ICASA has issued out a notice reminding providers of wireless networks of the need to stay within the defined licence-exempt bands. ICASA further refers to an upcoming crackdown on use of non-licence-exempt bands without the appropriate spectrum licence: from our information it looks like a new monitoring network will be launched shortly which will underpin this enforcement effort. [28 September 2015] Some small revisions and amendments made, with particular reference to ICASA’s new process regarding the E and V Bands. [7 May 2015] We have prepared an updated version of this Guide reflecting changes introduced by the Radio Frequency Spectrum Regulations 2015 (as amended). [22 October 2013] There is a great deal of confusion as to the licence-exempt frequency bands which may be used for wireless access services in South Africa. The below Guide was prepared for the Wireless Access Providers’ Association (WAPA) to bring some clarity to the matter. Note that due to the lack of clarity in the law reliance on this Guideline as a sole source without checking with ICASA is not advised and there remains debate over the correct position in some bands, [particularly 5.8 GHz ISM). We did send a copy to them for comment but none was received.